In an other forum we discussed the construction of the gallion of dutch ships of the17th century. I also discovered that it is quite difficult to conclude from fotographic material or drawings whether or not the ralings are curved in more than one direction, or not. Is there anayone here who can shed light on this issue? I think you know me from the other forum as "Foxtrott" and I was part of the discussion. You can cut out the shape of the curved beakhead from a cardboard. If you look at the edge of the board, there is a straight line. If you turn the card, a curve appears which is increasingly curved the more you continue to rotate. The headrails with the sideplanking of the beakhead are fixed at an angle so that the vertical view of the plan looks slightly to its sides and shows a slight inboard-curve. But maybe, Fred or someone else can tell us more about it. But as I have been puzzling on the gallion of the Prins Willem ,and the same discussion popped up, I thought, why not ask here. I did have resonable grades in math, but still, I am struggling to discover in which direction the railings of these gallions are curved. In Prins Willem I know for sure (as I tried to make the thing) it is as you tell with Wasa: the curves you see in the foto's are the result of a curve in only one direction, seen from an angle. So, most probably that is also the case with Wasa. 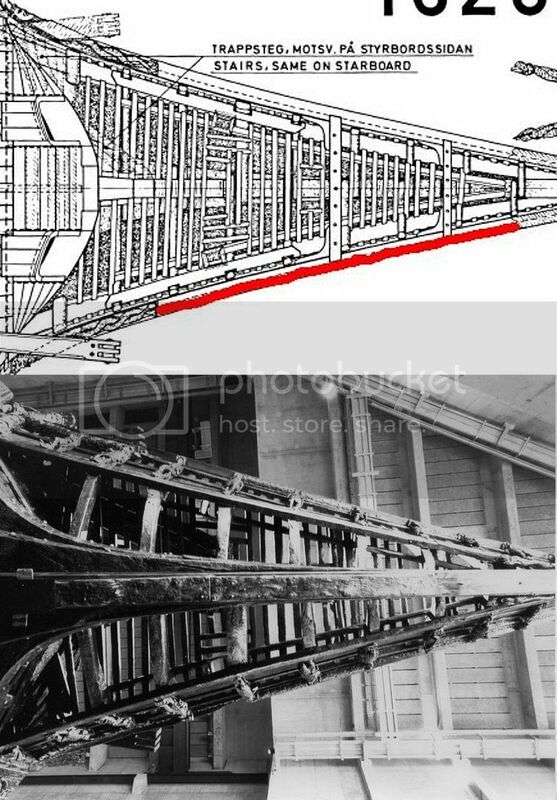 for my model of the Vasa, it was no problem to constuct the bulkhead. I was a little surprised because I expected a lot more problems. And it's easy to compare how the perspective on the galion changes when viewed from different directions. It's very similar to what can be observed on the plans and pictures of the original. That is, what I described with the cardboard. Fortunately, we have very good documentation of the Vasa and views are possible from many directions. But there is always the risk of a false interpretation. This is a good question, and a tricky one to answer. We documented the beakhead in 3-d in quite some detail partly to get to the bottom of it. The answer is that the sides of the beakhead are nominally flat, although there are some humps and hollows due to the inconsistencies of initial production and later conservation. This means that the railings bend in only one plane for most of their length, except for the caprails, which curve in multiple planes because they are fitted at an angle to the curved upper edge of a plank.Even these do not wander too much.